Pancakes: Fluffy, Tall, and Green? Wednesdays are exciting because it is the day of my CSA pick up and farmers' market day. The produce all look so enticing that it's too easy for me to shop more than I really should. The real estate in my fridge is precious and I always want to free up some space. Just the other day when I open the fridge door, that ginormous bag of beet greens was mocking me, taking up half of my produce drawer. Making soup is an efficient way to reduce a large pile of greens into manageable size but a beet greens soup is not quite the follow up act to the summer borscht made from his brothers. What to do? 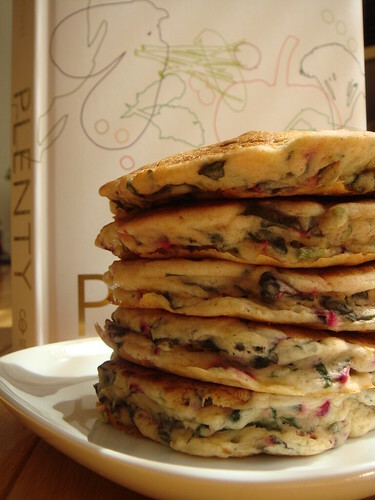 Ottolenghi's Plenty has some unexpected dishes and the Green Pancakes with Lime Butter was one. It turns a familiar sweet treat to savory by adding spinach, cumin, and spring onion to the batter. How brilliant! I was intantly inspired to adapt it for the beet greens. The original recipe calls for a pancake batter made with self-rising flour and whole milk, neither of which I have at home. I turned to the reliable The Cake Bible and its fluffy buttermilk pancake recipe. As you can see in the photo, these pancakes are TALL! Each of them is about 1/2 inch thick and smells absolutely divine from the cumin and spring onion. A bit of heat is added in the form of finely diced jalapeno. If you look closely, you can see a slight tint of pink because of the wilted beet greens. Savory pancake really isn't all that strange. If you like chicken & waffle, this fluffy buttermilk pancake packed with flavours isn't a big stretch. Definitely a welcome change to brunch. They would be great with some grilled sausages but equally at home served with lavender & thyme roasted poussins to mop up the delicious pan jus. Bring a large pot of water to boil. Cook the beet greens until just wilt. Rinse under cold water so it keeps the vibrant colour. Drain and squeeze as much water as you can from the greens. Roughly chop and toss together with green onion and jalapeno. Set aside. In a large mixing bowl, whisk together flour, baking powder, cumin, and salt. In a medium mixing bowl, stir together buttermilk and egg yolks. Gently stir buttermilk mixture into the flour mixture. It's okay to have a few lumps. You don't want to overwork the batter. Stir in melted butter and chopped vegetable. In a clean mixing bowl, whisk egg whites until foamy. Add cream of tartar and whip until soft peak stage. Take a big dollop of egg whites and gently fold it into the batter. This lightens up the batter so you can fold in the remaining egg whites without losing much volumn. The batter would be very airy and thick. Heat a frying pan or griddle until a drop of water sizzles. Coat the surface with a teaspoon of vegetable oil. Ladle in about half a cup of batter and coax it into a round. Fry in medium heat on both sides until cooked through. Repeat until all the batter is gone. We are currently experiencing a heat wave in Toronto. Although I appreciate milder weather, this heat and humidity really are too much! Of course I still have a hearty appetite but all I crave now is chilled food. Salad? Always. Fresh fruit? Of course. And then there's cold soup. There are people who love cold soup and there are people who find the whole concept strange. I am of the former camp. In fact, I enjoy eating things straight out of the fridge as soon as the mercury rises. There are always plenty of ready-to-eat food in my fridge. When I come home starving after a hard workout, I don't even want to wait another second to reheat my meal. As you can imagine, cold soup fits my eating habit seamlessly. Gazpacho and vichyssoise are classic examples of cold soup but there are really so much more. This week, I made the most of the summer bounty from my CSA share and enjoyed not one, but two cold soups. They both highlight the flavour of fresh vegetable harvest at the height of the season. What not to love? In a medium size pot, cover the beets with water. Bring to boil and lower the heat to medium. Cook for 30-60 minutes depending on the size of the beets until tender. Set aside to cool. When the beets are cooled enough to handle, slip the skin off. Measure 1L of the cooking liquid and set aside. If there isn't enough, top it with more water until you have 1L. Reserve a quarter of the beets. 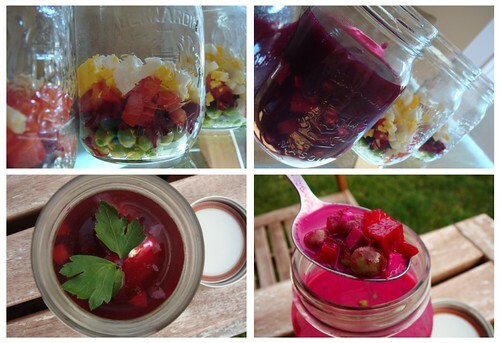 In a food processor or a blender, combine the remaining beets, red onion, spring onion, dill, lime/lemon juice. If you're using a food processor, add in about a cup of the beet cooking liquid and process until smooth. If you're using a blender, you can add in all the cooking liquid and blend until smooth. Empty the pureed beets into a large mixing bowl. If you used a food processor, stir in the remaining cooking liquid. Season with vinegar, salt, and pepper. Chill 2 hours or overnight for the flavour to meld. Dice the reserved beets. Divide them evenly between four 500mL Mason Jars. Layer with green peas, tomatoes, and hardboiled eggs. Store in fridge. When the broth is ready, ladle them into the four jars. Store in fridge until ready to serve. To serve, simply remove a jar from fridge and garnish with a tablespoon of sour cream and a dusting of paprika. I love to see the deep jewel tone of the broth turn neon pink when I stir in the sour cream. That touch of richness really makes this soup shine! In a large heavy bottom pot, heat butter and olive oil until butter starts to foam. Sautee the garlic scapes, spring onion, and parsley until fragrant. Add in lettuce and cook until it wilts. Add in splashes of water or vegetable broth if necessary to help with the cooking. 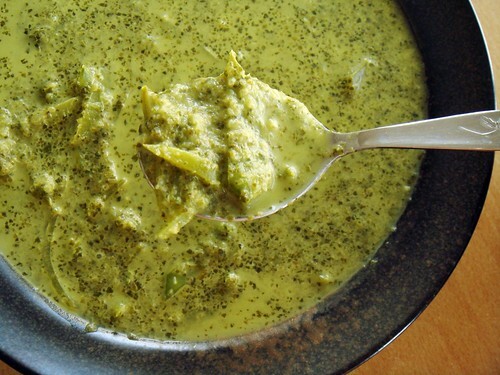 Empty the vegetable into the bowl of a food processor or blender. If you're using a food processor, add about 1 cup of water or broth and process until smooth. If you're using a blender, feel free to add in all the water or broth and blend until smooth. Return the pureed vegetable back to the pot and any remaining water or broth. Bring to boil and season with salt and pepper. Add the creme fraiche or heavy cream. Simmer until soup is just a little thickened. Adjust seasoning and remove from heat. Toss in the snow peas. The remaining heat from the soup will soften them just a bit but still retain a good crunch. You are not trying to make them mushy. Divide between 3 Mason jars of 500mL size. Chill in refridgerator until ready to serve. I call this Peter And The Feast. I love to cook for friends so hosting a party is a no-brainer. However, the amount of work involved can be a bit much to handle and that's why I don't do it too often. Let's just say it's been a while since I last invited big group of friends to my home. Like most things, cooking for a group takes practice. All the planning and scheduling and cooking and cleaning and prepping...so that I can enjoy my party and the great company! While I was cooking, my laptop sat prominently on my kitchen counter. Curious guests would comment on it. Some even thought it was a bit of obsessive but my spreadsheet of menu and schedule was crucial in my planning. It ensured that I got all my shopping and prep work done in specific order days leading up to the party. 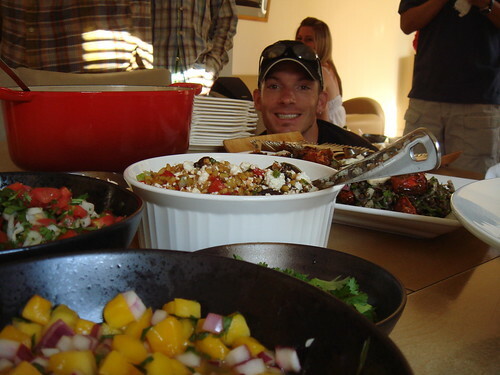 On party day, it kept me on schedule so that all the dishes were ready on time for our feast. Watermelon Strawberry Agua Fresca: a refreshing blend of strained watermelon and strawberry puree is served on the rocks with club soda or fizzy mineral water. Garnish with mint and lime. Loosely adapted from Simply Recipes. This is also an excellent mixer for spirits (tequila, vodka, white rum comes to mind). 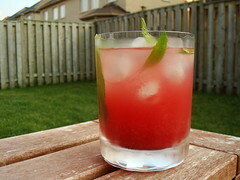 I took the time to strain the fruit puree because I wanted a more clear effect with the drink. Pineapple Ginger Agua Fresca: a ginger simple syrup is mixed with strained pineapple puree. Also served on the rocks with club soda but even better with rum! The ginger flavour is subtle but definitely adds an intriguing element to the sweet fruitiness of pineapple. Recipe from Matt Bites. Pineapple is much more fibrous than watermelon. 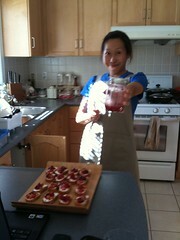 Making use of a cheesecloth to strain out the fruit jucie was helpful. Spicy Pretzel & Nut Mix: I made batches of this for gifting a little while ago. It may look plain, just a bowl of pretzel and mixed nuts. Well, take one bite and you'll understand why I cannot get enough of this snack! The nuts and pretzels were coated with a mixture of maple syrup, brown sugar, smoked paprika, cinnamon, cocoa. The mingling of sweet, salty, and spicy make for such an addictive bite. Recipe from David Lebovitz. I used the version from his book Sweet Life In Paris which is slightly different than the online version. Tortilla Chips: Need plenty of them for dipping. Love the fresh corn flavours of the ones I got from Whole Foods. Guacamole: Who doesn't like guacamole? (well, I can actually think of one person...hmm). This is a very simple version made with mashed avocados, lime juice, salt, and handful of pico de gallo. 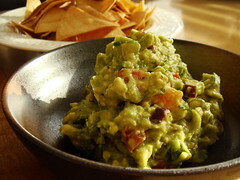 The recipe comes from The Pioneer Woman Cooks and it's my standard way of making guacamole. Because when you want guacamole, chances are you want pico de gallo too. May as well streamline the work so I can free up more time for other dishes! 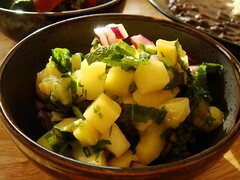 Mango Mint Salsa: If you want a recipe with minimal effort but great taste, this is it. This salsa is so refreshing that I can eat it like fruit salad...which is not too far from what it is. Diced frozen mangoes were tossed with red onion, mint leaves, freshly squeezed lime juice, and salt. By the time everything is mixed together, the mangoes would be defrost and your salsa would be just chilled. Olive Cheese Bread: Toasted french bread is topped with a decadent mixture of melted Monteray Jack cheese, black & green olives, and spring onion. This is one recipe that I've been eyeing for a few months but simply didn't have an occasion or audience to actually make it. Let's just be clear: it's NOT diet food. But OMG is it ever good. I want a slice now. 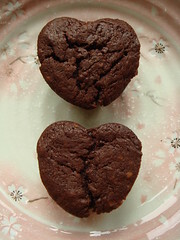 Recipe from The Pioneer Woman Cooks. I didn't get a chance to take a good picture before it was all gone. It's not likely I'll make this again for a glamour shot either. Oh well. I'll just have to dream about it day and night. Rhubarb Cherry Chutney Crostini: After three sweet rhubarb dishes in a row, I decided to finish my rhubarb season on a savory note. This rhubarb cherry chutney was my answer. 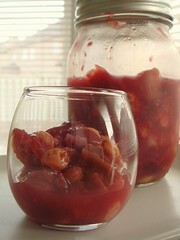 I loosely adapted from this epicurious recipe by using half rhubarb and half cherries (both bing and sour). I replaced the currants with golden raisins and swapped green onions for shallots. The result was impressive so I served it at the party on top of crostini smeared with cream cheese. Actually, when nobody's looking, I like to eat this chutney by the spoonful. Ottolenghi rules this section of the menu. Since I bought their two cookbooks a while ago, they've completely transformed my daily meals. The flavour is bold and the combination of ingredients is unexpected. I had a hard time picking which two salads to make for the party. 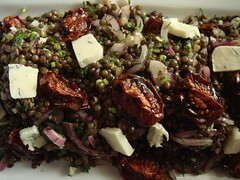 Lentil Tomato Gorgonzola Salad: This is an encore of the same one I shared at an office potluck not too long ago. I love cooking and eating lentils. They are quick to cook and take on flavours so well. I learned to toss them with vinaigrette while they are still warm for best absorption. Lentils de Puys are tossed with red onion, garlic, red wine vinegar, garlic scapes, dill, parsley, and olive oil before laying with oven-dried kumatoes and chunks of Gorgonzola Dolce. I can eat this all day long. 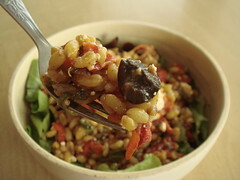 Kamut & Roasted Red Peppter Salad: This salad came about in a rather serendipitous fasion. I first spotted bags of sweet red pepper for a great price. So I roasted them all that very same night. Then I tried Kamut for the very first time and totally fell in love with it (rich and nutty compare to the more common wheatberries). Putting two and two together and this recipe from Ottolenghi practically jumped out of the page. A citrus honey vinaigrette adds just the right level of sweetness to Kamut, roasted red pepper, thyme, briny black olives, and crumbled feta cheese. I would make this again in a heartbeat. Deciding on the main course was tricky. I did not know the number of guests so I needed dishes that are easy to scale up to feed a crowd. I got the idea in my head that I wanted to make pulled pork. 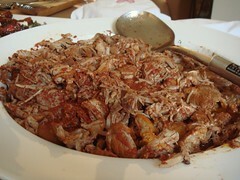 Flipping through my to-cook list revealed a cochinita pibil recipe I bookmarked long ago. Continuing with the mexican/tex-mex theme, I returned to a trusty white chili recipe I made back in winter. The best part? They condiments can be mix-and-match so guests are free to customize their mains to their hearts' content! Cochinita Pibil served with Corn Tortilla, Sour Cream, Pico De Gallo: This is pulled pork marinated in a citrus achiotte marinate before long hours of slow roasting wrapped in banana leafs. To be honest, I've never made anything like this before and I was worry how it would turn out. I completely placed my trust on the recipe from Simply Recipe. Luckily, it was one of the most delicious pork dishes I've ever made. My favourite way is to eat it with sour cream, mango mint salsa, and cilantro all wrapped in warm fluffy corn tortilla. Heavenly. One thing that I learned is to warm large amount of corn tortillas for a crowd. I bought a traditional 2-tier Chinese bamboo steamer. I placed about a dozen tortilla in each tier. The steamer sat in a stock pot with about 1/2" of water. Bring water to boil, turn off heat, and let the steam does its magic for 15 minutes. The tortilla came out warm and fluffy. No sogginess! 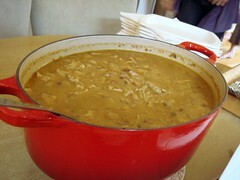 White Chicken Chili served with Cotija Cheese, Cilantro: Shredded chicken (dark meat, of course) and Rancho Gordo yellow-eye peas with onion, cumin, green chili, and jalapeno. This hearty stew was thickened with milk and cornmeal. Recipe from The Pioneer Woman Cooks. What I thought was the most reliable dish turned out to be one that made me worry most. The chili was so brothy that I had to thicken it further with cornstarch slurry. Fortunatley, all ended well as the longer cooking time gave the flavour more chance to meld together. It was especially good with crumbled cotija cheese and cilantro. It may be a little unconventional but I also like to line the bottle of my bowl with a fresh corn tortilla before ladling in the chili. By the time I finished the chili, the tortilla was saturated with sauce...just the way I like it! I really wish I had time to take better picture of the mains. When they were ready at the table, I was famish myself and just wanted to dig in. Well, I do have some leftover stashed away in the freezer. Perhaps I'll set up a proper shoot with them soon. Considering how dessert is typically my forte, my menu selection was uncharacteristically low-key. However, with so many other things going on, things that could be made in advance were big considerations. Ice-Cream Sundae In Waffle Bowl served with Homemade Chocolate Sauce, Kirsch Cherries, Whipped Cream: Sorry, no pictures yet! All the photos we have do not do it justice. I made a finger-licking-worthy chocolate sauce from Pierre Herme's recipe. Every time I opened the fridge to see this jar of chocolate sauce, my heart skipped a beat. Waffle bowls were set on coffee filters (perfect size) and the inside were lined with mini marshmallows. The marshmallows were there to soak up any melted ice-cream. Pretty smart, eh? I filled each bowl with scoops of caramel and vanilla ice-cream, spoonfuls of warm chocolate sauce, boozy kirsch cherries, and fresh whipped cream. I've been craving a good ice-cream sundae for such a long time. This over-the-top version did not disappoint. I am quite happy with how every dish turned out but I was even happier that dinner was served on time. Everything came together like a pieces of puzzles. Most important of all, everyone had a good time and I got to spend time hanging out with friends old and new. That's what makes parties fun, right?